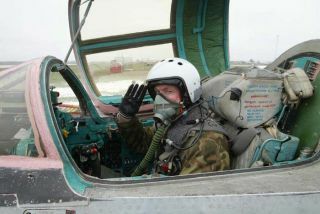 Greg Olsen sits in the cockpit of a Russian jet. The cost of trekking to the Moon, rounding it, and heading back to Earth is priced at a "circum-spectacular" cost of $100 million a seat, in U.S. dollars. Two commercial seats per would be available. More good news: A third seat is occupied by a pilot cosmonaut. Future DSE missions plan to include lunar-orbit and lunar-surface missions.